At this point, I'm going to bold and underline words that are pertinent and that I might address in future articles. Careful meditation on them may reveal many inner (and outter) "truths" to you. 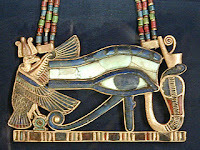 Commonly known as the "Eye of Horus" (and of Ra), and reaching our days as "the all seeing eye". 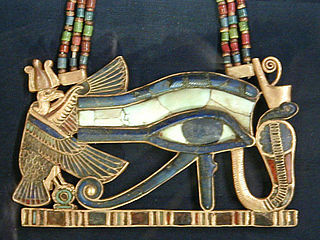 It's actually the eye of Wadjet, the goddess depicted in the helmet/crown of some pharaohs, in the form of a upright risen snake (it has a more profound meaning which I won't mention yet for the sake of convenience). Greeks and Romans knew this name Wadget by "uraeus" - which is "snake rising up in protection" - which is derived from the Egyptian word "iaret" which in turn means "risen one" (mind the bolds!). I'll now let you draw parallels. 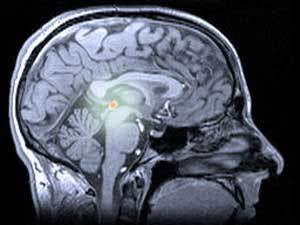 Above you have - slightly enhanced - the brain's pineal gland and it's surroundings . It's yet unclear what is the full purpose of this gland. It seems to go somewhat "quiet" at adult age. However, it's very clear in an esoteric context that this is an important gland which may be involved in what we would now view as paranormal abilities. There's a whole method of "awakening" senses this gland (and some other bits in your body) is suposed to handle. That is described in many alegories metaphoricaly as "Salvation". The whole point of this article is focus on "snake", "risen" and "seeing". Oh, and of course, "I".